Editing your WooCommerce product pages won't affect integration. The link between your WooCommerce product and Inkthreadable product will remain unaffected by changes to the product title, price, product tags, images, etc. The only edits that will affect integration involve the product variants. Adding or removing variants will either add or remove variants linked to Inkthreadable through integration, and if you're adding more you'll need to make sure these are correctly linked to the equivalent Inkthreadable product. Creating products and exporting them to WooCommerce through your Inkthreadable account will automatically trigger product pages to be generated within your store. These pages will be populated with information from Inkthreadable and linked to the equivalent product in your account, but you might want to edit this information after the product has been imported. To make any necessary changes you'll first need to log in to your WooCommerce store and navigate to your products page. Changing product details is simple using the WooCommerce interface. And changing these details does not affect integration. To amend a product's details just click on its name in this list. You can edit the title at the top of this product page. Look to the right of your Title box, underneath the Publish box, and you'll see Product Categories. 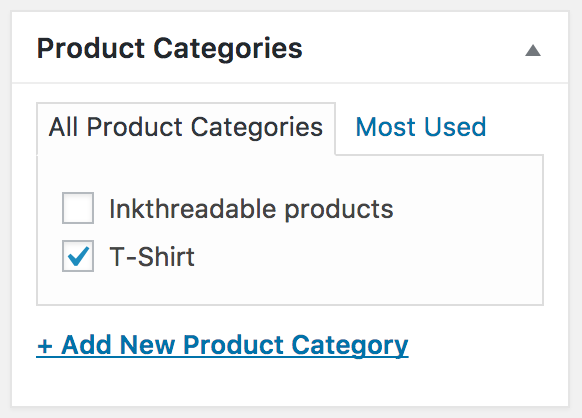 If the category you'd like to assign isn't available, click the Add New Product Category link and add a new category for the product you're editing. But if the category you want is already listed, simply select it. Below the Product Categories box, you'll see two boxes relating to product images: Product Image and Product Gallery. The Product Image is the master image that displays by default when customers are browsing your store. By default, the Product Image is set to the first variant. If you'd like to change this, click the Set product image link and select the image from your gallery that you'd like to assign as this product's master image. If you'd like to add or remove any images from this product's listing, you'll need to edit your Product Gallery. Hover your curser over the image you'd like to delete and the icon to delete the image will appear. Click this icon to remove it from your Product Gallery. If you delete the wrong image you can re-add it by clicking the Add product gallery images link and selecting the image from your gallery. If you scroll down a little you'll see a list of tabs under which you can edit various details, including price and product variations. Under the Attributes tab, you'll be able to add the attributes through which you can add variations to your product page. Each attribute needs to be separated with a pipe symbol (|) as above, and both checkboxes for Visible on the product page and Used for variants need to be checked. Make sure to click the Save attributes button before continuing. Under the Variations tab, you can add variations of your product to your product page. If you've imported from Inkthreadable your variations will already be listed here. If this product has been imported from Inkthreadable these prices will likely already be set correctly, but if not you can change them here. Changing these prices will only alter what your customer pays. Under Regular price, enter the price you'd like to sell this product at.